Our cover shows a young cleric, perhaps a student at the university of Paris, offering money to a girl who, to judge by the drum in her hand, is off to take part in a ring-dance, or carole. To the left stands a libidinous demon, while to their right a friar holds an open book of the Old Testament and raises his hand in warning. 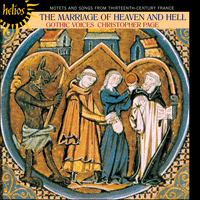 This Parisian picture is a fine emblem of the music on this record: the motet of the thirteenth century. Like the student and the girl, the motet of the years between 1200 and 1300 was caught between the lure of the secular and the summons of the sacred—between Heaven and Hell. Although it developed from the liturgical music of Paris, the motet form has come down to us with texts of every kind: some devout, some lascivious, some facetious, some wistfully romantic. The music, we may be sure, often has something in common with the songs of the ring-dances, the caroles. This diagram emphasizes that each voice in a polyphonic conductus sings musical phrases of the same length, the phrases entering and leaving together and constantly tending towards units of four beats. This happens because a polyphonic conductus is essentially a strictly measured recitation of one Latin text by two, three or four voices, often a text cast in accentual lines of four stresses. As this diagram shows, the Tenor part of a motet (so called from Latin tenere, meaning ‘to hold’, because the Tenor part ‘held’ the piece together) was often arranged in short, stereotyped rhythmic units that were constantly repeated. This Tenor was usually a section of plainchant, whence the Latin cues in the titles of the motets recorded here. These cues, generally present (but not always correctly identified) in the sources, indicate the word or syllable which originally bore the Tenor melody in the chant. Now all of this may seem a sad decline from the humane ideals of the conductus; there the Tenor was usually an expansive and melodious part, freshly made by a composer striving to produce (in the words of one thirteenth-century musician) ‘as beautiful a melody as he can make’. This only shows how paradoxical changes in artistic style can be, for the technique of iterating rhythmic units in a small section of plainchant excited the imagination of composers in a powerful way, and hundreds of motets have survived which use this technique. Above all, perhaps, this Tenor organization helps to give the motet its characteristic sense of being suspended in time; we hear that the piece is advancing, and yet the Tenor, exercising many subtle controls over the register and content of the upper parts, keeps circling in one place, refusing to develop. There is another revolutionary concept embodied in the above diagram of motet structure: an overlap of musical phrases. This represents a reaction against the style and sound of the conductus, for motet style exploits the delicious sense of forward movement—and of lilt—when a voice brings a phrase to an end just as a phrase in another voice is beginning. A further difference between the conductus and the motet is that in a conductus the voices sing the same words, but in a motet each texted voice has words of its own. Sometimes, indeed, the parts of a motet carry texts which treat different subjects in different languages. This produces a sound-picture quite unlike that of a conductus where all the vowels—and all the vowel changes—are synchronized. We might say that in a conductus the changes in the harmony of the music are dramatized by abrupt and unanimous changes in the harmonics of the sound (to sing a vowel is to set the vocal tract in a way that will privilege certain partials in the note). In the motet, however, a chord may contain two, three or four distinct vowels, and since the texts are different there are no simultaneous changes of vowel timbre. Indeed, synchronization of vowel colour is so rare in the motet that it becomes a special artistic device, where a motet is brought to a decisive close as both the Triplum and the Motetus sing the word ‘amorete’, or as in several other items where syllables of the same of similar sound are cunningly placed at the same point in all the voices. A principal result of this contrast is that the conductus lends itself very well to a forthright declamation; the unanimity of vowel timbre produces a bright set of primary shades. The motet, however, often possesses a more veiled sound in performance since the primary colours of the vowels are mixed together, and the more one mixes colours the more opaque the shade becomes. This kind of music should not be performed before the general populace for they do not understand its subtlety, nor do they delight in hearing it, but [let it only be performed] before the learned and before those who are seeking for subtleties in the arts. So says Johannes de Grocheio in his De musica of c1300. Johannes adored Paris; leaving his Norman home, where the great town fairs were the principal distractions in a province of vast fields and seigneurial castles, he found in Paris a great city where ‘the bread of the world was baked’. This saying, a common one in the 1200s, conveyed more than an assurance that all was well in the wharves and markets by the Seine; it embodied a proud claim that Paris supplied all Europe with the most rigorous theology and the most prudent legal advice. Between 1200 and 1300 the Parisians also provided Europe with the most inventive polyphonic music. As far as we can tell, the motet as represented on this recording was a Parisian creation, and these pieces would originally have been performed either in Paris or in the Parisian circles of men who had spent some time in the schools before returning home or to their religious community. They might be friars, perhaps, who had studied at the expense of their order, or members of a cathedral chapter gathered in some house in the close. As Johannes de Grocheio says, motets were for the learned; in other words they were not for the people who thronged the churches of St Gervase and St Leufroy on the great feasts—not for the tanners, carpenters and apothecaries. This is all very well, but there is something suspicious about the idea—a common one today—that motets were only for intellectuals and connoisseurs. For one thing, it is an idea with a tinge of anachronism; we run the risk of confusing the medieval musician with the twentieth-century stereotype of the composer as intellectual, experimenting with dissonance to produce intense miniatures for the discerning few. Let us remember that the texts of motets are often in the vernacular and would have been intelligible to any tanner or apothecary; what is more, the lively texts and melodies of many voice-parts in motets probably had something in common with the idiom of the dance songs, the caroles, which the students, tradesmen and girls of Paris celebrated on the fields of St Germain (it is a near certainty that snatches of dance songs, both text and music, are quoted in some motets). In short, while it is true that the motet repertoire contains many musical subtleties for the discerning listener, we miss much of the pleasure which they can give if we fail to recognize that their characteristic tone is often poised, to borrow a good phrase from Chaucer, betwixt ‘earnest and game’. Part of the ‘game’ lies in the melodic fluency of many of these pieces; they offer lyrical, vocal melodies of an instantly accessible kind. The melodies are highly variable in character, needless to say, but in general they are ingratiating, are beautifully judged to lie in the best part of the voice, and are so delightfully phrased that they embody all the qualities so often celebrated in motet poetry, being cler and legier. Often, in performing these motets, the singer can be moved by the sheer lilt of the music, a quality not usually associated with thirteenth-century polyphony of any kind. It was certainly a daring step to combine two—or even three—such melodies, each with its own text, in one composition. How was one supposed to listen to such a piece? It has been suggested that a motet challenged the listener to follow all the texts at the same time, but that seems unlikely. The comprehensibility of even one text is reduced when we hear it sung, for word-bearing melody has the power to weaken the discursive attention that we usually bring to language when we see it written or hear it said. If two texts are sung simultaneously then full comprehension of each becomes well-nigh impossible and was perhaps not the principal source of delight; the pleasure comes from the sense of sheer diversity and invention that we receive when the ear discerns a moment of one text, now a moment of another, amidst the kaleidoscope of vowel colours. Achieving brightness of vowel timbre, indeed, is a cardinal matter in performing these motets, not only because of the tendency to a certain veiled quality which is present in all polytextual music, but also because vowel colour in a motet is a crucial part of each melodic line’s assertion of independence. It has often been suggested that the French poetry of motets is ‘derived from the poetry of the trouvères’ and so on, but judgements of that sort hide more than they reveal. Granted, the love celebrated in motet verse often sounds like the amor of the troubadours and trouvères—love as suffering, the lady as physician, and so on—but that was how one spoke of love in Old French poetry, both lyric and narrative; there was no other way. Instead of mistakenly seeking to trace the origins of motet poetry to the trouvères we should rather linger over the differences between the French motet and the trouvère chanson. Before c1240 very few trouvères of note composed poems like those given here for the French motets; compare the songs by Blondel de Nesle or Gautier de Dargies with any of the French motet texts and the contrasts begin to emerge. Trouvère poems are usually made from a set of identical stanzas, not from a single verse paragraph with lines of widely varied length; they rhyme according to a strict pattern, not in an opportunistic way; their rhyming is essentially discreet, not noisy with the iterated sounds of the front vowels ‘i’ and ‘e’; trouvère songs in the High Style are lyrics, not narratives or semi-narratives of shepherds and their rustic loves. The motet poems, in contrast, display all of the features which the trouvère songs do not have, and they wed this essentially light-courtly poetry to a learned musical technique. Compare, for example, the classic troubadour song by Bernart de Ventadorn, Can vei la lauzeta mover with the motet voice whose text is initially based upon it, Quant voi l'alouete; where Bernart is expansive and serious, the motet voice is light and tripping. There is not the least indication in thirteenth-century sources that contemporary musicians would have regarded the large monophonic chanson of the troubadours and trouvères as a slight form beside the polyphonic motet; on the contrary, trouvère songs in the best style were increasingly associated in the thirteenth century with the memory of aristocratic trouvères of the first generation—Gace Brulé, for example, or Gautier de Dargies; our Parisian witness who spoke of the motet, Johannes de Grocheio, rules that trouvère songs should be performed for a royal and princely audience. According to the understanding of vernacular song which developed in twelfth- and thirteenth-century France, the vernacular motets, with their tendency to short-range melodic patterns, chirping rhymes and the rest, were inherently light and unserious; the pleasing paradox was that their ‘game’ was wedded to a musical technique that was very much in ‘earnest’.